When you think of Iowa you don’t necessarily think of forested wilderness. As one of Iowa’s major state forests, Yellow River State Forest is an exception in our state. At 8,503 acres, it is three times larger than Lake MacBride which is Iowa’s largest state park. Iowa has ten state forest areas consisting of four major and six smaller forests. The major state forests, such as Yellow River State Forest, are broken up in to smaller sections called units. The recreational facilities at Yellow River State Forest such as trails and campgrounds are limited to the 5,237 acre Paint Creek unit. The rugged terrain of northeast Iowa’s driftless area makes Yellow River State Forest a stand out among the other forests in Iowa. It’s hard to find trails in Iowa that traverse 700 ft. elevation gains along rocky outcrops, bluffs and steep slopes. 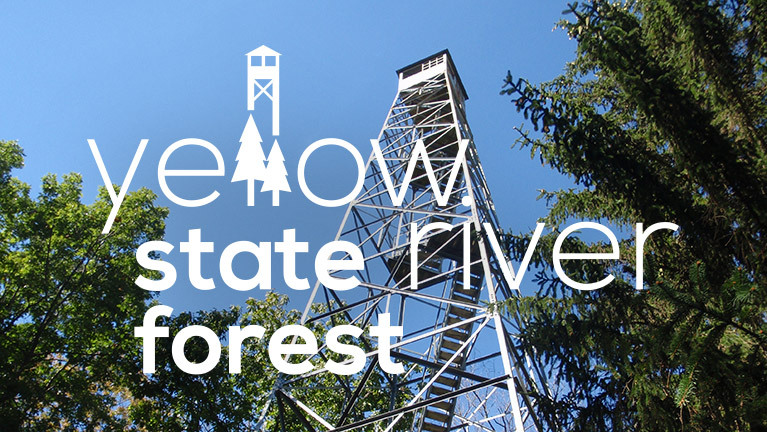 Yellow River State Forest has 24.59 miles of challenging trails that are suitable for hiking, backpacking, horseback riding, mountain biking, and trail running. In the winter months, gravel surface roads are closed to wheeled vehicles and become part of a snow mobile trail system. Portions of the equestrian and hiking trails are also groomed for cross country skiing. Hunting and trout fishing are the most popular activities in Yellow River State Forest. The forest is one of the largest public hunting areas in northeast Iowa. The DNR says that the wilderness area is good for hunting deer, wild turkey, rabbit, squirrel, and upland birds, including grouse and woodcock. Hunting is allowed in all units (except for campgrounds). Trout fishing is a year round activity in the forest. The Iowa DNR stocks Little Paint and Big Paint Creeks regularly. The DNR has observed naturally reproducing populations of Brown Trout in Little Paint Creek, and Rainbow Trout are overwintering in Big Paint Creek. If you’re not into a rugged adventure, it’s possible to drive some of the gravel roads deep into the forest and observe the wilderness from your vehicle. Some of the gravel roads can be in poor condition after rain or snow and are muddy or impassable. At times some gravel roads barely have room for two vehicles and it can be a challenge to turn around. Use a map and plan your route before venturing off blindly. Yellow River State Forest has a total of eight camping areas. All the camping facilities are primitive and none of the sites have electricity. Drinking water is available from spigots at the information kiosk on State Forest Road and at the forest headquarters. Big Paint Creek and Little Paint Creek are the most reliable water sources to filter water from. Anyone using the trails should bring water with them since trails and hike-in campsites are not always near these water sources. With the exception of the hike-in campsites, all campgrounds have pit toilets. Hike-in campers should follow Leave No Trace principals when dealing with waste. Deposit solid human waste in catholes dug six to eight inches deep, at least 200 feet from water, camp and trails. Cover and disguise the cathole when finished. Pack out toilet paper and hygiene products. Big Paint Campground is the first camping area you see as you drive in from the west. The proximity to hiking trails and the park headquarters make Big Paint Campground a good first night stay when setting out for a weekend of backpacking. The facility has 48 campsites and two pit toilets. The campground is positioned next to Big Paint Creek for easy access to trout fishing. All sites have a fire ring and camp pads that are grassy and level. Sites can accommodate RVs, trailers and tents. Little Paint Campground is large with 80 campsites and five pit toilets. All sites are either next to or have a view of Little Paint Creek for unfettered trout fishing opportunities. Just as in Big Paint Campground, sites are grassy and level with room for anything from RVs to tents. The south portion is open and would be a nice area for large groups to camp. The middle area has a couple private sites back from the road with excellent water access. The North end of the campground has many campsites along the bank of Little Paint Creek. Due to the flood event in the spring of 2013, many of the 40 sites at the equestrian campgrounds have been reworked. The results are facilities with well graded roads, rebuilt hitching posts with fresh sand around them, and newly groomed campsites. The major horse trails strategically converge around the equestrian campgrounds. It would be easy to take a long day ride or head out on numerous rugged loop trails over several days. Little Paint and Big Paint Creeks converge near the equestrian campgrounds and are a reliable water source for horses. Camp Glen Wendel is one of the four hike-in campsites. The camp is in an open meadow on the north facing slope of a ridge. It has an exposed feel and would not be my first choice if bad weather is predicted. Unobstructed views of the sky make this camp a superb site for star gazing at night. There are two fire rings at Glen Wendel and enough room for large groups to spread out. A small stagnant pond is in-camp with signs of past campers fishing here. You can easily hike up to Glen Wendel on White Pine Trail. This might be a good campsite if you want to quickly get into a backcountry site on your first night. You may hear a cow moo at the hike-in sites in Camp John Shultz but you’ll not likely hear people. If you do have to share the camp, there are five segregated campsites that are well spaced and feel private. Sites range from partial shade to full shade and all but two have fire rings. The three campsites at Brown’s Hollow Camp are nestled in a shady valley with a small creek. The sites are well spaced in an open grassy area and each has a fire ring. Sites are not as private as Camp John Shultz or Heffern’s Hill Camp, but there is plenty of room for large groups. The nearby creek can be a good source to filter water if it’s not dry. There are signs that the stream can also be a ragging torrent. I spotted high water debris dangerously close to camp so use caution if heavy rains are predicted. Proximity to roads, trails and water make Heffern’s Hill Camp a popular hike-in campsite. It’s possible to drive a short distance of gravel on Donahue Road and park near Heffern’s Hill Camp. The five sites are spread out with room for groups, yet each site is tucked into its own space in a sprawling and wandering camp area. The last campsite has a three sided wood shelter that would be nice to duck into during a storm. Mature trees surrounded the camp to baffle winds and make it feel protected from the elements. It’s a short trek down to the bridge over Paint Creek on Donahue Road. Once there, you can trout fish for dinner and filter water. If you really feel the need for backpacking luxury, hike to the nearby equestrian campgrounds and use the pit toilets. The trail system at Yellow River State Forest is one of the most rugged in the state. Trails are well worn and easy to follow. Hikers, horseback riders and mountain bikers must share about 14 miles of trails, however another 10.59 miles are exclusively for hikers. The trails never seem to be crowded so the experience is good for everyone looking for a little solitude. This is Iowa so signs of civilization are never far away. At times you may hear livestock in the distance and see row crops at the parks boundaries. Some trails are less rugged and require a little road hiking to complete the route. That said, it’s about the best place in Iowa to have a remote backcountry experience. Paint Creek Trail is a wide and level multi-use trail that runs along the north bank of Big Paint Creek. This 2.3 mile route is the backbone of the park and ties into many trails on its east/west course. The trail travels by campgrounds, roads, picnic areas, and other DNR buildings which make it an excellent hike if you want to get oriented with the forests recreational facilities. Parking areas close to this trail allow you to start a day of hiking or bike riding on Paint Creek and continue to other connecting trails. This is an easy trail to hike, however, it can get muddy in places and there is one stream crossing on the east end. The 1.69 mile Forester Trail is a rugged hiking only trail. You can pick up the trailhead at a small parking area on the west end of the forest just off State Forest Road. Most of the trail is a narrow single track path with occasional obstacles such as deadfall, branches and lush undergrowth. Forester Trail is a key route in the forest since it tracks by Camp Glen Wendel. The short .8 mile White Pine Trail offers excellent access to parking at the forest headquarters or by the information kiosk. Perhaps the most obvious use for White Pine is as a b-line route up to Camp Glen Wendel. The path provides a wide and quiet hike uphill from the trailhead into the forest. This is one of the most popular backpacking trails in the forest. Brown’s Hollow Trail is a 3.4 mile single-use trail that will get your heart pounding. Many hikers will start at the trailhead just off the headquarters parking lot. Immediately, you start an ascent through several steep ravines on your way up to Camp John Schultz. The dense vegetation deadens the sound in the forest and limits your field of view making Yellow River State Forest feel very remote. Once at Camp John Schultz you can pitch a tent or take a breather. The rest of the trail is downhill towards Brown’s Hollow Camp. There is a stretch of gravel road hiking on Fire Tower road, but vehicles are rarely seen and you will remain under a canopy of trees. The trail ends at the east trailhead off of Donahue Road. This trail is named after the only fire lookout structure in the state. Erected in 1962, the 100 foot fire tower was built on a high point 1,050 foot above sea level. The two mile multi-use Firetower Trail travels east/west along a high ridge with many trails connecting to it. The Firetower Trail is the backbone of the southern trail system and you will likely traverse it on your trek. This .6 mile multi-use trail is a short route to the popular Cedar Point Overlook. The overlook is somewhat overgrown in the summer and would be more picturesque in the late fall, winter or early spring when the foliage is less. The .55 mile Evergreen Trail is a unique interpretive hiking trail that highlights a variety of mature evergreen trees. As you trek this path deep in the forest you will come upon well-labeled posts with the tree species name. This is a remote and quiet route and it’s fun to linger at each evergreen type and note their distinct characteristics. This beautiful 2.69 mile mutli-use loop trail that is popular with horseback riders and mountain bikers. The west end of the trail dips down to a small pond. The winding path soon climbs back up and remains level. The south side of the loop trail has a large bare ground clearing that is an obvious rest area for horses. The east end of the trail cuts along the side of a picturesque forested ravine. This would be the highlight of the trail on a mountain bike and offer amazing views on horseback. Proximity to the equestrian campsites and challenging terrain makes this muti-use loop trail one of the most used horse routes in the park. There is no way around a steep climb on the 3.8 mile Saddle Trail Loop. The west side follows a ravine without switchbacks. The west side cuts along a steep hillside. Watch the trail closely for loose rocks and roots. This 1.8 mile single-use hiking trail is the perfect place to build your endurance for a bigger adventure out west or on the Appalachian Trail. To get to the top of Heffern’s Hill you have your choice of two steep climbs with no switchbacks. If you thought the climb up was a challenge, getting down will prove to be equally grueling. Shortcut Trail is a good way to get up into the trail system from Little Paint Campground. Starting from the trailhead at Little Paint Campground you follow a modest uphill ascent to Kelley Road. This is a one mile multi-use trail that horseback riders, hikers and mountain bikers use to connect with the Larkin Valley Trail or vice versa. Larkin Valley Trail is a wide multi-use trail. At 2.1 miles it the longest continuous trail to descend into the forest valley and it screams bike run to the bottom. Be prepared to climb or descend over 300 feet in elevation between the low point trailhead on State Forest Road to the high point trailhead on Kelly Road. Bluff Trail is the best route for the panoramic views of the forest valley. This 1.5 mile single-use hiking trail follows a road until you reach its southern leg. The south portion of the trail travels along a sheer 200 foot drop-off. Scenic vistas can be found just off of the trail at several openings in the foliage near rock outcroppings. Yellow River State Forest offers Iowans access to a unique expanse of backcountry terrain. The forest is large enough to feel remote and rugged enough to test your physical abilities. As a hiker, I enjoyed walking Forester Trail to Brown’s Hollow Trail. I also remember my lunch spot with a panoramic view on a rocky outcropping just off of Bluff Trail. My next trip will include a mountain bike for trail riding and a pole to catch a trout dinner. I’m glad you enjoyed the description. Did you take a trip to Yellow River? I’m planning a fall trip to see if anything has changed. My 10 year old son and I did a two day, two nighter at Yellow River last March. We love hiking and camping when it is still cool out. Yellow River was awesome. We hiked 8.5 miles the first day and another 5.5 the next. Kinda wandered all over, but that is what these trips are for. Really enjoy your reviews. Thanks much. Fantastic! Sounds like you guys put the miles in at YRSF! I agree — the shoulder seasons are best for hiking in my opinion. Thank you for posting all this info! I passed through the area while on a motorcycle trip a few years ago and didn’t have much time to explore. Hope to return and see more of it this year! My pleasure John. I hope your return trip allows you more time to explore Yellow River. Wow – what great memories. If you ever get up there again, maybe you could take a picture of the tree and send it my way. I’d be happy to post it here next to your comment.